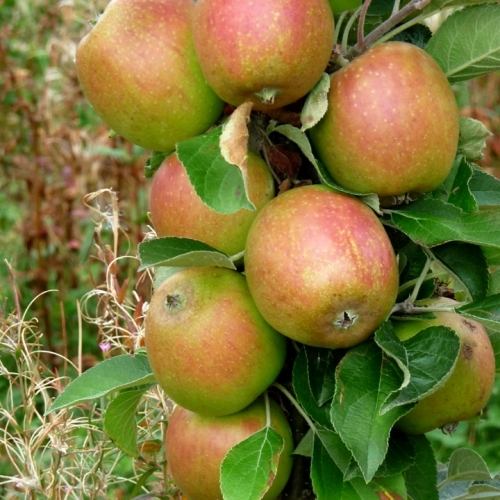 Fruit trees for sale | Self Fertile Apple Trees. Most suburban situations provide good pollen due to the close proximity of other gardens. It is not always necessary to have pollinators if the bees and other pollinating insects are generous with their visits. If you have no other Apple tree close by then select two varieties in the same group or the adjoining group ie group 2 and 4 will pollinate group 3 as will any others in group 3. All varieties in this section are self fertile. Dessert Apple Christmas Pearmain fruit trees - Raised by Mr Manser around 1893. Small to medium size, long-conical, green to yellow, becoming dull yellow. One half to three quarters flushed with dull orange to red which becomes brighter. The flesh is firm with good flavour. Compact growth habit making this an ideal variety for the smaller garden. Picking time late September. Pollination group 2. Very pleased with the tree that I purchased 3 years ago. Fruits well each year and great flavour and texture.